The following links provide access to the Modern Monetary Theory interviews with Professors William Mitchell and Randy Wray which were recorded on May 29, 2009 at Newcastle, Australia. The interviewer was Dr Victor Quirk. They are in standard video mp4 format. How do we assess the response by Governments to date? How does the monetary system work? How do Bond markets work? Do budget deficits cause higher interest rates? Do we have to pay back budget deficits? nce upon a time there was a small community comprising 100 dog bone-winners and their families. Each morning for as long as anyone can remember the 100 dogs set off into the field to dig for bones to bring back home to their families. The government's bone policy was designed to ensure that there were always enough bones for all the bone-winners to succeed in their search and no dog families went without a bone. The community was secure, young dogs were happy and well prepared to take over the bone-winner's role when the older dogs retired. There was no bone-stealing and all the bone-winners always had an incentive to get up each day to dig for the bones that were buried in the field each night. Each morning, the bone-winners would groom themselves with pride and head off to the field. You could see how keen they were to get on the road and go and dig for bones (see picture to right). One day the 100 dog bone-winners set off for the field and when they arrived they found there were only 94 bones buried. Some dogs who were always very sharp dug up two bones as usual, others dug up the usual one bone. However, as a matter of accounting, at least 6 dog bone-winners returned home to their families that day bone-less. There was initial despair but because this had never happened before the bone-less families pulled together and ensured that their bone-winner maintained spirit and arose earlier than usual next morning and spent the extra time grooming and getting prepared for the day in the field. But the pattern set in and the next day the 100 dogs set out to dig for 94 bones. They searched vigorously but only 94 bones were in the field. The situation started to get desperate and the government bone policy took a sharp turn and started to focus on the motivation of the bone-seekers who were bone-less. Consultants were called in - dog psychologists and dog-trainers - to work on the attitudes of the bone-less dogs. Initially there was resistance because the dogs didn't feel that they were to blame. 100 dogs but only 94 bones. The Bone Network was established by BoneCentre to provide various programs designed to help the bone-less dogs get back into bone-winning shape and organisations sprung up all over the small community to offer Bone Network services. The bone-less dogs began to hear new terms like bone-seekers and the staff in the Bone Network provider offices often called them clients. As time went by changes continued and each bone-less dog (and by now more than 25 per cent of them had been in that state for over 52 weeks) had to attend the nearest Bone Network office and be classified by the Bone Seeker Classification Instrument (BSCI). One dog was asked about the assessment process undertaken in the BSCI interview by the BoneCentre officer. The dog replied that the BoneCentre officer had a big sheet and put down numbers. Every time the dog fidgeted a bit a bad score under the heading "observable behaviours" was noted. The bone-less dog was considered a problem if they were "too quiet", or "too loud", or "talked over", or used "inappropriate or aggressive language", "talked incessantly", showed a "lack of insight", had "unusual dress", "inappropriate make-up application", and "shaked, paced, twitched, trembled" and almost any other sign of nervousness that accompanied their bone-less state. The young dogs in the dog-school yards started using new words to describe the dog-parents who were bone-less. One bone-less dog heard his young pup using terminology like Bone Snobs in the back dog-yard one evening and the dog was filled with despair and self-hate. 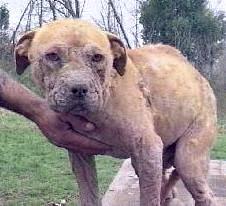 You could clearly observe the change in the grooming and bearing of the bone-less dogs. Once proud now forlorn. Some of them became ill while others found their families were no longer the happy places as they had previously been. The dog divorce rate increased. The typical vibrant nightly family discussions that came after the day's bone digging were now marked with a sense of purposelessness and the whole bone-less dog-family was affected. BoneCentre also introduced a new scheme designed to ensure that the bone-less dogs earned the survival bones that were given to them. This became known as the very popular Dig For The Bone program and BoneCentre officials talked endlessly about compliance and mutual obligation. One bone-less dog muttered that mutual was like a tango - it needed two parties to be successful. BoneCentre also commissioned a major consultant's report which identified eight bone seeker segments, which reflected the bone-seeker's level of motivation towards the bone search activity. A complex diagram summarised the eight segments. Only one of these segments was focused on by the community's media next day. It identified Cruising Bone Seekers who were described as being relaxed about being bone-less and didn't really want to return to the field and had stopped going out to the field each day. The terminology quickly entered the kid's dog-school yard jargon. Any dog walking down the street during the hours when they would normally be digging in the field were taunted with the term. But there were still 100 dogs willing to dig each day and only 94 bones. BoneCentre published a monthly Bone-Less rate and this became contentious because the definition of being bone-less excluded those who didn't go out to the field each day. The same dogs had always gone out and would again but they understood the equation - 100 dogs 94 bones. BoneCentre said that the Bone-Less rate was around 3 per cent and would drop further once the benefits of the Bone Network were realised. Some of the help given by the Bone Network helped make some individuals more motivated and aggressive and so subtle changes were noticed in the composition of the bone-less dogs at the end of each day. But no matter how many resources BoneCentre pumped into the Bone Network, there were still many dogs who remained bone-less day in day out. They steadily lost their pride and their appearance became increasingly worrying (see a typical Long-Term Bone-Less Dog to the right). The rate of bone theft rose dramatically and dog prisons started to grow at a faster rate than dog schools as the government rallied the community around law and order issues. However, whichever way you counted the bone-less rate there were 100 dogs wanting to go to the field each day and only 94 bones were buried there. 100 dogs and 94 bones. Thanks to Phillip Harvey for inspiration. Ideal for children as a bed-time story. It teaches them about their future. Neoclassical monetary theory considers that money enters into the economy via exchange. The current stock of money is determined by the interaction with high powered money (issued by the Central Bank (CB)) and the money multiplier (which is a function of the reserve ratio and deposits ratio). Thus, the CB controls the money supply (it is exogenous). Interest rates in this model are endogenous and rise if budget deficit spending rise as a result of the squeeze in the money market. The only way a budget deficit can occur without higher interest rates is if the CB increases high powered money and that is considered inflationary. Further, deficits require bond-financing which implies that taxes have to be higher in the future. In this brief, we show that government spending does not require financing. Taxes are levied (in part) to ensure that the private sector has an incentive to transfer goods and services to the public sector in response to Government spending of fiat currency. The Government is the monopoly provider of fiat currency. The private sector (households and firms, including banks) has to acquire the fiat currency to pay its taxes. If the Government is in deficit, then the surplus fiat currency in the private sector is accumulated as cash, bank reserves, or as Treasury Bonds (deposits offered by the CB). The taxes are scrapped (either the cash is burned or the CB wipes off liabilities from its balance sheet). Logically, taxes cannot finance spending because fiat currency has to be spent prior to taxes being paid. Why are bonds-issued? They provide the financial system with an interest-bearing asset and allow banks with excess reserves an opportunity to earn above a zero return. Bond issues are part of monetary policy. If the fiscal spending has created excess reserves and there is downward pressure on the cash rate, then the CB can sell bonds as a means of maintaining their cash rate goals. Spending adds to reserves while taxes and bond sales drain reserves. The latter are considered to be part of the CB reserve maintenance operations. These are termed vertical components and include the obtaining of fiat currency from the State, the paying of taxes to the State, or any intermediation in the process. CB policy determines the relative distribution of the accumulated currency units of the private sector between cash, reserves (clearing balances), and Treasury securities. State (deficit) spending determines the magnitude of those accumulated financial assets. The horizontal component is well-described in Post Keynesian monetary theory and includes the all credit activities that leverage of the fiat currency. While the vertical component is exogenous, the horizontal component is endogenous and nets to zero. The banking system responds to depends for credit to finance production and then worries about the reserve implications. The CB stands ready to lend reserves should the banks fall short to maintain stability of the system and the current cash rate target. Government spending cannot crowd out investment in this setting. The diagram below summarises this discussion. This is a summary of a Professorial Lecture that William Mitchell presented in November 2000 in Newcastle, Australia following his appointment to the Chair of Economics in October 1998. A more complete account is available at this link - How economics is failing us. The United Nations Human Rights Declaration states "Everyone has the right to work, to free choice of employment, to just and favourable conditions of work and to protection against unemployment." Since 1975, the Australian Government has not honoured its responsibilities as a signatory and has been abetted by the economics profession, obsessed with the Market. Individual greed has replaced overall community welfare as the goal of both. 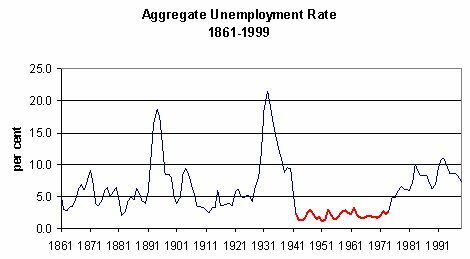 The diagram depicts the aggregate unemployment rate since 1861. The period from 1940 to 1975 was special because it was the only time that there has been strong public sector involvement. We enjoyed full employment as a result. In other periods, the unfettered private market has never consistently delivered low unemployment rates. Prior to the Great Depression, the role of government in stabilising economic fluctuations was non-existent. The market system was highly unstable with the unemployment rate rarely below 5 per cent. Economists of the day believed that mass unemployment was impossible because the Market would always adjust prices to ensure full employment. This is despite very high unemployment in the 1890s. The Great Depression taught us that free market policies, like cutting wage rates, did not solve mass unemployment. In 1936, an English economist, John Maynard Keynes, argued that monetary policy (adjusting interest rates) and fiscal policy (changing tax and government spending levels) could offset economic fluctuations in private sector investment and maintain low unemployment. The mixed economy was born - the Market attenuated by a strong public sector. From that period up until 1975, Australia maintained full employment and declining inequality because the collective will and shared values became stronger than the market emphasis on the individual. This required and allowed the government to play a key role to act on our behalf to distribute resources more equally to maintain low unemployment rates. Since 1975, economists imbued with a conservative market-oriented zeal have swept back into influence despite their ideas being discredited during the Great Depression. Most governments adopted economic rationalism - a belief that the Market should be allowed to operate without government regulation or involvement and that individual greed should be pursued above community goals. This is despite the failure of academic research to find empirical evidence supporting the central propositions of the rationalist approach. However, the lack of empirical substance has not stopped the ideologues trampling over the fabric of our society. The other side of rationalism is the belief that individuals are responsible for their own outcomes. So poverty and unemployment is due to laziness - a failure to work or pursue sufficient education to guarantee non-poverty wages. The mean-spirited Mutual Obligation policy currently being pursued is based upon this view of the individual. The fact that employers can get away with paying wages that leave a full-time worker poor or that the Market does not provide enough work for all is never questioned. Rationalists argue that all assets should meet the market test of profitability and therefore must be in private hands. The resulting privatisations have merely handed over public wealth to private well-off minorities. There is scant evidence of efficiency gains. The insistence that public institutions should pursue the goals of a private corporation is never questioned? Rationalists merely sneer at the notion of public service. The result has been increasing inequality, increasing poverty rates, persistently high unemployment, increasingly insecure and fractional employment opportunities, destructive cuts to tertiary education, and a failure to invest in the future. The harsh public sector cutbacks are myopic in the extreme and will lead to Australia slipping in world economic rankings in the period ahead. For example, it is palpable that Australia has one of the lowest rates of public investment in information technology network infrastructure. We have also witnessed the hypocrisy of government underwriting of inefficient private operators, as in the case of the recent private health fund subsidies. Continued reliance on the Market will worsen economic inequality and maintain the persistently high unemployment levels. It is essential that the balance between the public sector and the private sector be restored to the levels that gave us the low unemployment after the War. The Centre of Full Employment and Equity advocates the introduction of a Job Guarantee, which would be consistent with the United Nations Human Rights Declaration. This would allow the public sector to restore the capacity of an employer of last resort to the economy. It would mean that those disadvantaged by the private sector's inability to generate enough employment for all would be given job opportunities at the living wage. There are a range of unfulfilled community and environmental needs that could form the focus for these jobs. It would be non-inflationary because the wage paid would be at the bottom of the current private sector wage structure. A range of social wage initiatives would support the Job Guarantee. Under a Job Guarantee, the dole would be abandoned. There would also be a host of other savings (for example, the reductions in costs of the health system, the family court system and the criminal justice system alone would be significant). Taking these into account, the Centre computes it would cost of $7.2 billion over one year to employ 1 million unemployed (and hidden unemployed) workers under the Job Guarantee. The cost would vary with the fluctuations in private sector employment. In the context of the current budget surplus (over $12 billion), the cost of the Olympics ($8 billion), the corporate welfare handouts to private companies (over $14 $14 billion per year), and the tax cuts given to the high income groups to accompany the GST ($6.5 billion), the initial cost of the Job Guarantee should hardly raise an eyebrow. The returns of having everyone in meaningful employment would be substantial. The 2000 Olympics made us all feel good. We rediscovered a sense of community, shared values, and the collective will. Despite having placed our faith in the Market for several years, the Olympics showed us the effectiveness of the public sector in delivering goods and services and allocating resources in a socially efficient manner. Much of the organisation reflected planned outcomes aimed at delivering public services rather than allocations driven by expectations of a market return. Maybe there is hope after all that this destructive and divisive period of economic rationalism will pass. This archive collection mostly comprises interviews with William Mitchell on current affairs topics. Please note we stopped archiving this material in 2012. Some more recent multimedia material is available at www.billmitchell.org. ABC Radio National Breakfast - Youth Unemployment in Australia - January 25, 2012 - Audio. 5AA Adelaide - Youth unemployment on the rise - January 25, 2012 - Audio. ABC Brisbane Morning Show - Youth Unemployment in Australia - January 21, 2012 - Audio. ABC Overnight - Unemployment in Australia - September 14, 2011 - Audio. ABC PM Radio - Labour Force data release - September 8, 2011 - Audio. ABC PM Radio - Inflation - April 27, 2011 - Audio. The Wire Radio - Rivers of Gold Dry Up - April 21, 2011 - Audio. Radio Adelaide - Implications of Federal Election for Workers' Rights - August 26, 2010 - Audio. ABC News Radio - Labour Force data release - January 15, 2010 - Audio. ABC AM current affairs - Retail sales expected to rise - January 7, 2010 - Audio - Full Segment Transcript. ABC Radio National Saturday Extra - The Future of Coal Forum - November 14, 2009 - Audio - ABC Saturday Extra Home Page - Video available. ABC PM current affairs - Bernanke warns on interest rate rise - October 9, 2009 - Audio - Full Segment Transcript. ABC Radio National Breakfast - Youth Unemployment - October 8, 2009 - Audio. ABC World Today - OECD warns of jobs crisis - September 17, 2009 - Audio - Full Segment Transcript. ABC World Today - Call for more stimulus as economy falters - September 11, 2009 - Audio - Full Segment Transcript. ABC World Today - IMF Report on Australian Economy - August 10, 2009 - Audio - Full Segment Transcript. ABC PM current affairs - State of Australian Economy - July 3, 2009 - Audio - Full Segment Transcript. ABC National News - EVI release - March 17, 2009 - Audio. ABC PM Current Affairs - Underemployment Data - February 24, 2009 - Audio. Speech - The origins of the economic crisis - February 24, 2009 - an edited version of a 45 minute presentation. It runs for around 30 minutes - Audio. ABC PM Current Affairs - Unemployment Data - February 12, 2009 - Audio - Transcript. ABC Radio National Interest - Full Employment - February 6, 2009 - Story. ABC Radio National Life Matters - vocational training - December 4, 2008 - Audio - Story. Official Launch Regional Employment Report - Adelaide, December 1, 2008 - Information. ABC PM Current Affairs - Release of Job Guarantee Report - December 2, 2008 - Audio - Transcript. ABC PM Current Affairs - November 20, 2008 - Audio - Transcript. ABC PM Current Affairs - October 9, 2008 - Audio - Transcript. ABC Radio National Breakfast Panel - September 5, 2008 - Audio. ABC The World Today Budget Panel - May 15, 2008 - Audio. Radio National Australia Talks - February 28, 2008 - Audio. Radio National Breakfast - October 17, 2007 - Audio. ABC Late Night Live - August 16, 2007 - Audio. ABC PM - Underemployment - February 26, 2007 - Audio. ABC Radio National Interest - July 16, 2006 - Audio. Please go to - www.billmitchell.org - for an extensive collection of video presentations. He is an archive of the regular Op Ed articles written on items of public interest. From 2009, the Op Ed commentary was published in the Director's Blog and CofFEE no longer produced a separate publication for download. A paradigm shift in economic policy - Newcastle Herald, October 16 2008. A child's guide to the sub-prime crisis and other problems - Newcastle Herald, July 19 2008. NSW state budget commentary 2008-09 - Newcastle Herald, May 2008. Federal budget commentary 2008-09 - Newcastle Herald, May 14, 2008. The Great Australian Dream heads further south! - Newcastle Herald, November 8, 2007. NSW state budget commentary 2007-08 - Newcastle Herald, June 20, 2007. Higher Education Endowment Fund - a scam - Newcastle Herald, May 15, 2007. Federal budget commentary 2007-08 - Newcastle Herald, May 9, 2007. Full Employment? Not even close - Newcastle Herald, December 11, 2006. August RBA interest rate rise commentary - Newcastle Herald, August 3, 2006.